That's it. 2015 is done and dusted. Well, almost. Looking back on the year I have to confess that I didn't manage to read nearly as much as I would have liked. With a new full-time job and the added responsibility of my freelance work I've discovered just how precious having time to read can be. 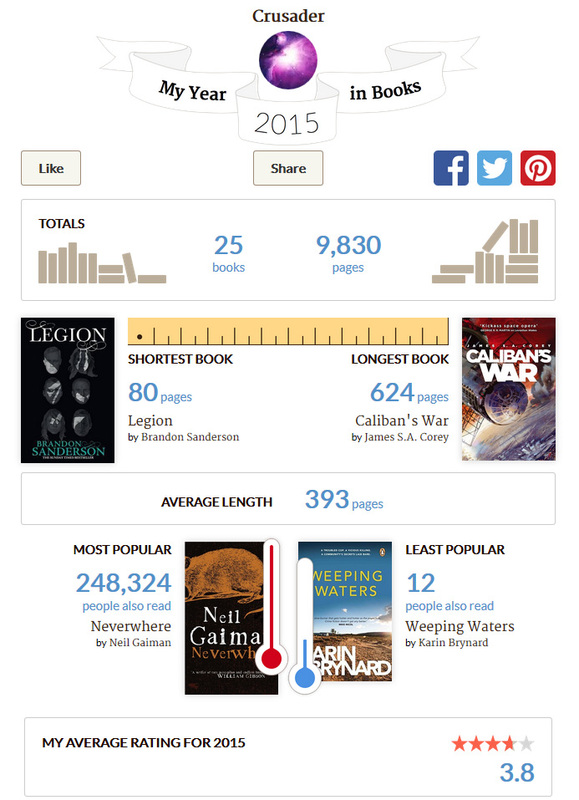 My goal for the year was to read 25 books. I thought that it would be a breeze to achieve, but I barely managed to make it. If it wasn't for a brief week-long vacation over December I might have failed miserably. While my reading might have lacked in quantity it certainly didn't lack in quality. Here are my top 5 reads for the year in no particular order. For making me care so much about the characters and then betraying me every step of the way. Read full review. For keeping me guessing until the very end. Read full review. For its intimate, character-driven story, its epic scope and the utterly haunting ending. Read full review. 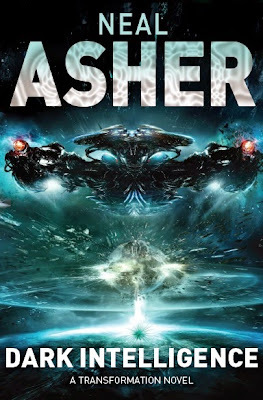 For providing that unique Asher magic - a high-tech, action-packed cinematic space opera extravaganza in book form. 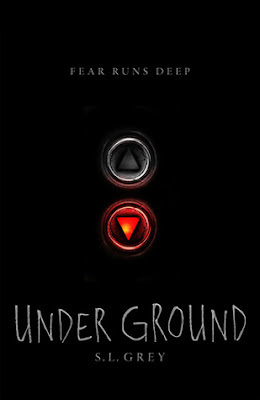 For its brilliant concept and the sheer amount of humour and suspense crammed into just 80 pages. Read full review. Here's to a 2016 filled with even more amazing books and enough time to read them all. Happy New Year! 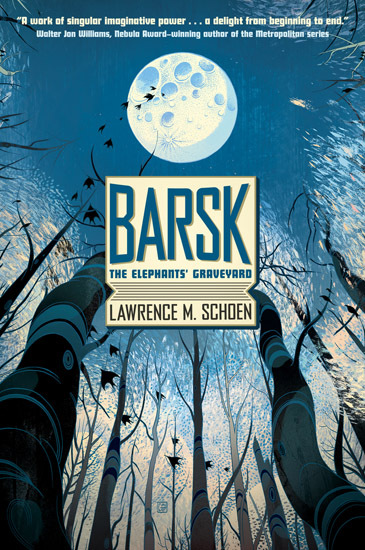 Check back on 5 January when Lawrence M. Schoen will be sharing some of his favourite authors as part of the Barsk Blog Tour. Yesterday, in dire need of a comfort read before heading back to work after an all too brief 5-day vacation, I re-read Terry Pratchett's Hogfather. It remains one of my favourite Discworld novels and with it being the season for jolly men in red suits creeping around at night, I couldn't think of a more appropriate time. Like all the Discworld novels Hogfather is filled with so much wit and hidden wisdom that each reading offers something new to discover. So here, presented with a complete lack of context, is some of the best bits that had me either laughing like a mad man or contemplating our mortal existence - sometimes both at once. 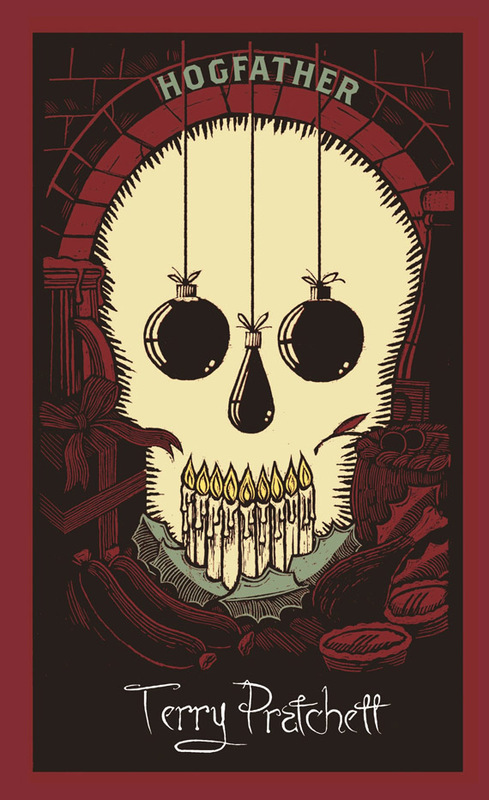 If you haven't read Hogfather yet I recommend that you remedy that situation as soon as possible. It's bloody brilliant! She sighed. Normality was what you made it. ‘Never say die, master. That’s our motto, eh?’ said Albert. I CAN’T SAY IT’S EVER REALLY BEEN MINE. In Biers, unless you weren’t choosy, it paid to order a drink that was transparent because Igor also had undirected ideas about what you could stick on the end of a cocktail stick. If you saw something spherical and green, you just had to hope that it was an olive. LET’S GET THERE AND SLEIGH THEM. HO. HO. HO. THAT WAS A PUNE OR PLAY ON WORDS, ALBERT. I DON’T KNOW IF YOU NOTICED. —and a sword. It was four feet long and glinted along the blade. The mother took a deep breath. “You can’t give her that!” she screamed. Binky was not challenged by the high stairs. It wasn’t that he flew. It was simply that he walked on a ground level of his own devising. It really was a crummy room, the sort rented by someone who probably took it never intending to stay long, the sort where walking across the floor in the middle of the night would be accompanied by the crack of cockroaches in a death flamenco. It was amazing how many people spent their whole lives in places where they never intended to stay. On the simple table by the bed was a small, rather crude portrait of a bulldog in a wig, although on closer inspection it might have been a woman. This tentative hypothesis was borne out by the inscription “To a Good Boy, from his Mother” on the back. Everyone, it is said, has a book inside them. In this library, everyone was inside a book. “We all have. It’s called ‘living,’” said the Archchancellor shortly. IT IS THE THINGS YOU BELIEVE WHICH MAKE YOU HUMAN. GOOD THINGS AND BAD THINGS, IT’S ALL THE SAME. YOU THINK SO? THEN TAKE THE UNIVERSE AND GRIND IT DOWN TO THE FINEST POWDER AND SIEVE IT THROUGH THE FINEST SIEVE AND THEN SHOW ME ONE ATOM OF JUSTICE, ONE MOLECULE OF MERCY. AND YET— Death waved a hand. AND YET YOU ACT AS IF THERE IS SOME IDEAL ORDER IN THE WORLD, AS IF THERE IS SOME … SOME RIGHTNESS IN THE UNIVERSE BY WHICH IT MAY BE JUDGED. As clichéd as it may sound dynamite does come in small packages and Legion, Brandon Sanderson’s novella, packs a potent punch. In just 68 pages Sanderson manages to weave a captivating, full-fledged crime thriller with a science fiction twist. Legion starts off with one of the best opening lines ever: “My name is Stephen Leeds, and I’m perfectly sane. 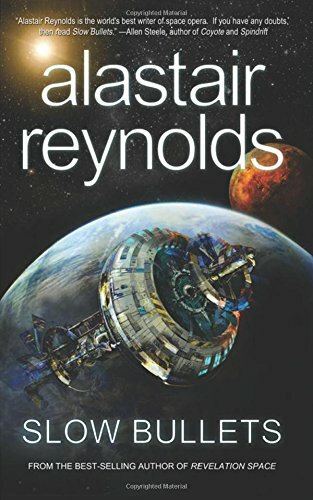 My hallucinations, however, are all quite mad.” With an opening like that I was sucked in completely and only stopped reading until I reached the very last page – the acknowledgements. Yes, I even read the acknowledgements in an effort to prolong the story. Stephen Leeds, the main protagonist is a brilliant man with a unique mental condition that allows him to conjure up different aspects. These aspects manifest themselves as fully independent hallucinatory characters, each with a specialized skill set of their own. Think along the lines of a schizophrenic Pretender and you’ll get the idea. Leeds gets hired to track down the inventor of a camera with an astounding property, an ability that could alter humanity’s understanding of history and the very fabric of society if it got into the wrong hands. His search for the camera tackles complex issues like religions, the implications of time travel, privacy and the impact of technology on society. Leeds is a fascinating, engaging character (as is all his aspects) with just enough information given about his mysterious mental condition and his enigmatic past to hook you. The fact that you don’t get all the answers or a full back-story is what makes this such an absorbing read. You keep reading just to discover more pieces of his past, tantalizing titbits which are casually worked in to the story. The relationship between Leeds and all his different aspects is where Legion really shines. They feel like entire characters on their own and the endearing, often hilarious interplay between them will have you laughing like a mad man or, at the very least, put a huge grin on your face. The ending resolves the story in a satisfying way, but you are left craving more. Leeds is such a fascinating character that you want to know far more about him than a single novella can provide. And that’s a good thing. 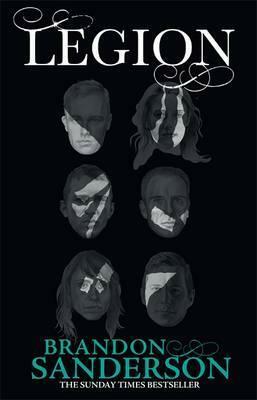 Legion is a fast, utterly captivating read filled with fascinating characters and hilarious moments that will leave you craving for more. 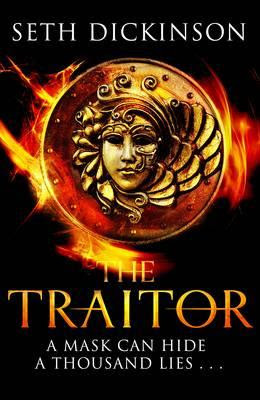 For a novella it packs one heck of a punch, the only downside is that it is so short. I’d gladly devour a thousand page epic filled with Leeds and his adventures. Highly recommended! 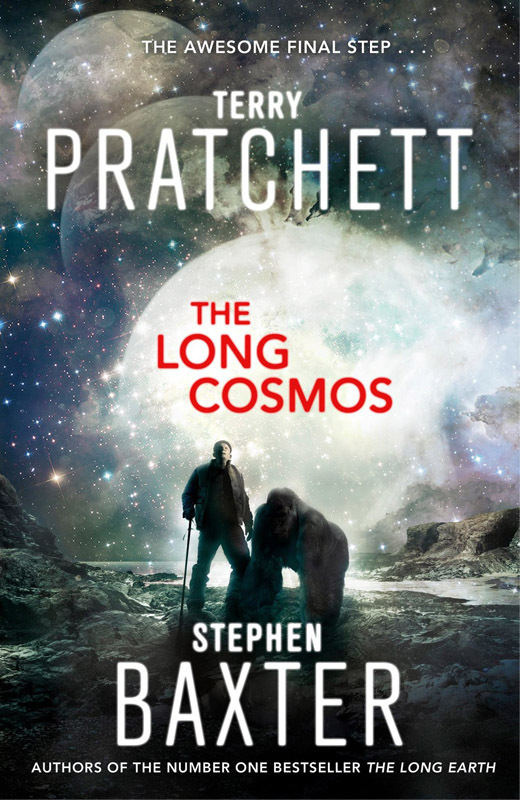 The UK cover for the final installment in Terry Pratchett and Stephen Baxter's Long Earth series, The Long Cosmos, has been unveiled. I really hope that this provides a satisfying conclusion to a series filled with endless wonder and possibilities..